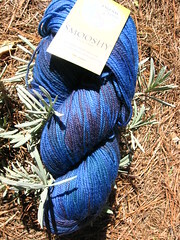 I won this gorgeous skein of yarn from Becky. She included a cute card with a nice note. In it, she wrote that she has a skein of this yarn, but bets that I will knit mine first. I have been lovingly petting the new yarn and thinking of what I would like to knit with it, but I believe it will have to wait. I think I am preparing to move into serious gift-knitting mode, with a side of UFO-finishing. I am excited about some of the presents I want to make. Thinking about them sometimes makes me wonder about the possibility of family members who may have found the blog, but are keeping quiet about it. If that is happening, (beyond the one who was told about this space) people might find their gift-y surprises rather unsurprising. Of course, I could always keep the projects secret until after I give the gifts, but that is decidedly unappealing. Another option would be doubling up the knitting and spinning so that I have more content for the blog. Yeah, that is not going to happen. I could have enough of a challenge finishing gifts in time. I am still considering the significance of a piece of information we received this week. The son was filling us in on the happenings of his life, (not a normal occurrence) and within this conversation, Bruce asked him whether things are getting serious with the girlfriend. For the first time ever about any relationship, the son replied in the affirmative. It makes me wonder whether she could be making her way onto the knit-gift-list sometime soon. It also makes me want to stick my head in the fiber bin and breathe in the soothing wool fumes. Then I could calmly make a list of gifts I want to make, along with a schedule for completing them. Either that or I could sift through books, patterns, and Ravelry for the perfect pattern to use with my new yarn. I could have cast on for something new, but I have been spinning, instead. I have not been making time for it lately, so I decided to change that. Rather than trying to find a lot of time, or the perfect time, I just grabbed fiber and wheel and enjoyed. While the pile of fluff meant for the first ply is still significant, the bobbin is not empty, either. I was trying to do long-draw, and every once in a while I was doing it. Then I would get excited, and it would be gone. I still have so much to learn. Somewhere I hear Margene's voice echoing, "It's the process." I spent some time with my book, Spin Control. It has me quite interested in spinning singles for yarn. I think the beautiful pictures are part of the inspiration. The skein and swatch in laceweight catch my attention every time I go through the book. While it is true that there is so much further for me to explore in the spinning world, I am not a complete beginner. I was able to help my grandma over the phone. She called last week with plying problems. It felt great to come home a few days later to a message on the answering machine letting me know that my thoughts on the matter worked for her. I am making my way through the alpaca fiber I solar-dyed with Kool-Aid a few months ago. I was not in love with how it looked after dyeing, but like it better as I spin the singles. This only makes me more interested in seeing what I end up with after the yarn is finished. I did not realize I have been presenting myself as powerful and in control of things both great and small. I was merely acknowledging that according to the calendar, it is a different season. Lest anyone feel jealous by thinking that I have been enjoying crisp, clear, Autumn-like weather, let me assure you that has not been the case. We have been in the eighties and rainy. The fungi are exploding. In between the sprinkles, showers, and downpours, it is a grey, suffocatingly humid existence. I was looking at the numbers for current conditions the other night, and they had us listed at eighty-one (I think) degrees, and ninety percent humidity. Blech. The weather people tell us there will be a cool-down next week. They have been offering this same hope most of the month. I have been mixing my looking forward with digging in the past. Some of this has been unpleasant and difficult, but I feel like I am making progress. Still, some of it has been good. I dug a hibernating project out of the stash and resumed knitting on it. That first glove has sat alone for far too long, so I cast on for its partner. It is already time to start the digits. I will definitely need a photography assistant after that, or at least the tripod. One glove knit and its partner ready for fingers is almost fo territory. I think that entitles me to cast on for something new. I am thinking lace. Of course, that is usually the case. We finally made it. This summer was not what I would have predicted, but that is often the case. This helps remind me not to become too concerned about what I think is going to happen. A new season is here, and I am looking to it with a hopeful heart with no idea of what is ahead. There will be changes; of that, I can be sure. One friend is moving away in a few days, and another could be within a few short months. The garden is nearly done for now. We still harvest a couple of tomatoes and okra each week. We have an over-abundance of okra from a neighbor who keeps hanging bags of it on the front door in thanks for Bruce cutting their grass occasionally. Bruce picked our only surviving watermelon and enjoyed what little there was. This year's watermelon growing was more successful than last. I am calling it a win, especially because I started this from seed. A nice, mindless knit is wonderful company. It is great when the brain is foggy and sluggish. It makes waiting time seem shorter. It is soothing during stressful times when anxious worry threatens to take over. A simple scarf like The Corrugator is a perfect example of such a knit. I often cast on for a scarf with much enthusiasm, and for the first three feet feel like I will be done in no time. Then my will to knit usually seems to die, or I feel like hanging myself with the yard of fabric. However, that was not the case with this scarf. I made it to the halfway point, baked a loaf of bread, and was ready to keep knitting. Whether laundry avoidance played a role, I am not saying. Anyway, I enjoyed knitting the scarf, and have the bonus of a timely finish. It is a birthday present for my brother. I hope he likes it. I think it is right for him. The color works with some of his preferred sports teams, and therefore his other apparel. Also, the yarn, ONLine Linie 21 Marly, is superwash. Since this scarf did not kill me, I am ready to begin another, but this one in red. I have not decided whether to do this pattern again, or go for something different. 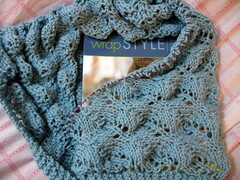 If I want mindless again, but a different pattern, I could go with the One Row Handspun Scarf. Perhaps I should go for a bit more excitement and try a Palindrome Scarf. Perhaps you think I have succumbed to the hungriness that has been plaguing me during my weight loss efforts. That does happen sometimes. However, I am talking about time. I gave most of my Monday over to cleaning and organizing. The living room knitting corner is much nicer now that I have tidied it. Tuesday turned out a bit differently than I planned. I met a puppy. Whether this is the new puppy for my mom remains to be seen. He is cute and sweet, but probably not the one. I am still puzzled how we left the house mid-afternoon and returned home around nine or ten, but that is what happened. My mind is so very fuzzy. We have somehow made our way to Wednesday, and the Shetland Triangle has been finished for days. This pattern, yarn, and US 9 needles makes for a quick knit. I like that there was not too much yarn leftover, and am pleased that I correctly decided when to switch from the main chart to the edging. While I only knit eight repeats of the main chart instead of the pattern recommended ten, it is still a nice sized shawl. I have finished dimensions around 72"x38" and I like the yarn even more after washing. I thought it was fine before, but a little soak in water and wool wash made a nice difference. I hope the birthday girl loves this as much as I enjoyed knitting it for her. It was a round birthday for her, and it fell amongst much busyness, so she has not had the chance to celebrate yet. I guess that just goes to show that time is being eaten up for others, too. Well, at least there will not be any more for Wrap Style. I have checked out that book a few times to knit the Shetland Triangle by Evelyn Clark. I think I ended up with late fees two out of three times. Now I do not have to worry about this, as I recently picked up a used copy of the book. Of course, I have also learned (last to know sometimes, I am) that one can now purchase that pattern individually from the designer's website, but I am still pleased to have the entire book. Since I have the book, plenty of yarn, and a gift-giving occasion perfect for a Shetland Triangle; you know what I have been knitting. 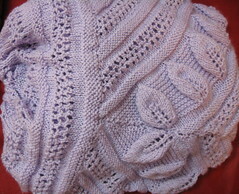 I am making this one with Jo Sharp Classic DK Wool. Knitting it has been so very enjoyable. I realized that most of my recent knitting has been non-wool. I love wool, and have missed it so much. The scale is unable to reflect the weight I have shed, but I feel the difference. Yes, I have been exercising and monitoring my food intake with FitDay, but this has nothing to do with that. So, what has me feeling as though I am light enough to float away? I finished the baby blanket! The bind-off took a few hours, but the method I chose really gave it a nice finish. We only have to look at it one more time. I know you must be thinking, "Sarah, it is yellow around the edges and looks larger than the 31"x31" as listed in the pattern." Why, yes, observant readers, it does have yellow around the edges and 42"x42" are its finished dimensions. I ran out of the lilac yarn, and the lady who asked me to knit this chose yellow as the best option for finishing. Personally, I cannot decide anything about it other than the fact that I knit it well. Not listing the gauge in sts/in(cm) but rather in finished dimensions of wonky square-ish pieces that are difficult to get proper measurement before finishing the blanket, or in finished depth of the edging, which, again, cannot be determined before finishing the blanket, makes this outcome a bit more understandable. That is the last thing I have to say about that pattern, other than the fact that I do not think I will knit it again for less than $1000. I have already delivered the blanket, and it is out of my life. I was already considering the next cast-on as I worked the bind-off for the blanket. There are so many possibilities, and now I can take the time to enjoy whichever will be next. 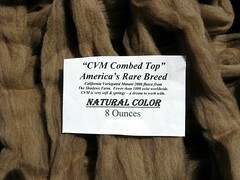 I have had some CVM fiber in the stash for a while, and have only admired it. I thought it so lovely that I got a little bit more. Then I felt a bit ridiculous about it remaining only in stash form. However, I was not ready to spin it, but I liked to think about it. I like the warm, sproingy, brown fluff, but occasionally thought about it being not brown. I think this must have been in my mind when I bought the second batch. Still, I have no idea how much Kool-Aid it would take to dye the fiber, and if this went poorly, it would likely be horrible. I know that over-dyeing would still be an option, but overdyeing unfortunately dyed brown wool is probably far beyond my KA-dyeing skills. Then again, even if the color turned out very wrong, the fiber is very right. 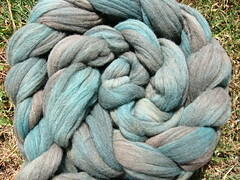 I would perhaps practice different spinning techniques with good fiber without worrying about wasting it if had already become unattractive due to my dyeing. If that is not reason enough, I do not know what is. So, I get out the giant pot, add the fiber, the water, and the Kool-Aid, and let the heat of the day do its thing. Darkness falls, and I try to not do the same as I bring it back inside. It does not look good. My husband thought it could be OK after drying. I poured off the water and started to remove the fiber. Lo and behold, the fiber at the bottom looks promising. Perhaps if I flip the fiber pile and try again, it might work. I think I like what I have done (it is darker than this picture). Now I just need to find the time to spin it. I did a little math, and have a better understanding of why I am not done with the baby blanket. On every other round of the border, two yarn-over increases are worked in each of the four corners. The total stitch count as written in the pattern reflects this increase in eight stitches. What it fails to take into account are the two yarn-overs for each of the 64 leaves. That would be 136 stitches increased on each of six rounds. That put the stitch count at 1460 stitches per round, but not for long. While the corner increases are still happening, on those same rounds, I get to decrease two stitches from each of the 64 leaves. Well, that's quite enough pattern chatter about a blanket no one else is likely to knit. It will be a lovely gift, and I will finish it soon. We kept my niece overnight on Saturday. While she was in the bathtub, she spent some time inspecting the washcloth. She knew that I had knit it, and was pointing to various parts and asking how I made them. Since it is a garter-stitch piece, there was not much to explain. Then she asked how I made the holes around the edge of the cloth. (mischievous grin) KOH: They're Hard-Yovers, lots and lots of Hard-Yovers. She was so pleased at her bit of teasing that she could hardly stop laughing, and I was soon laughing with her. I was also laughing about what her new knitting term brought to my mind. I immediately thought of the knitters who take one look at lace and declare that it is something they could never do because it is too hard. Even when a helpful knitter tries to explain that it is just a combination of decreases and yarn-overs, they will not hear of it. They have already convinced themselves that knitting lace requires Hard-Yovers. I get that various types of knitting require different levels of concentration, and that certain techniques and styles come more naturally to some and not so much to others. I just do not understand those declarations that one cannot do it at all. It may not be easy, it may require a quieter environment and greater concentration, and after trying, you might decide not to do it again, but if you want to, you can do it.